Prof. Edvin Aldrian is a Professor of Meteorology and Climatology at the Agency for Assessment aand Application of Technology BPPT Indonesia. 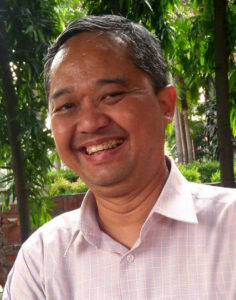 He teaches at the University of Indonesia and Bogor Agricultural Institute and Udayana University in Denpasar Bali. Currently Prof. Aldrian serves as IPCC WG1 Vice Chair representing Indonesia and countries in the Southwest Pacific region. Prof. Aldrian obtained his PhD in 2003 from Max Planck Institute for Meteorology Germany. Prof. Aldrian also served WMO as the Co Chair of Commission for Climatology for Expert Team on Institution and Infrastructure Capabilities group and WMO Co Vice Chair Regional Association V Working Group on Climate Services. Furthermore, he also served previously as EANET Scientific Advisory Committee. Prof. Aldrian has already published 32 peer reviewed International scientific publications, 46 National peer reviewed publications and 26 books or book chapters. He works mainly on global and regional climate issue including climate changes and actively becomes speakers for Climate Change sciences. Prof. Aldrian is active in promoting climate change science nationally and internationally as part of IPCC Outreach programme in South Asia and Southeast Asia.